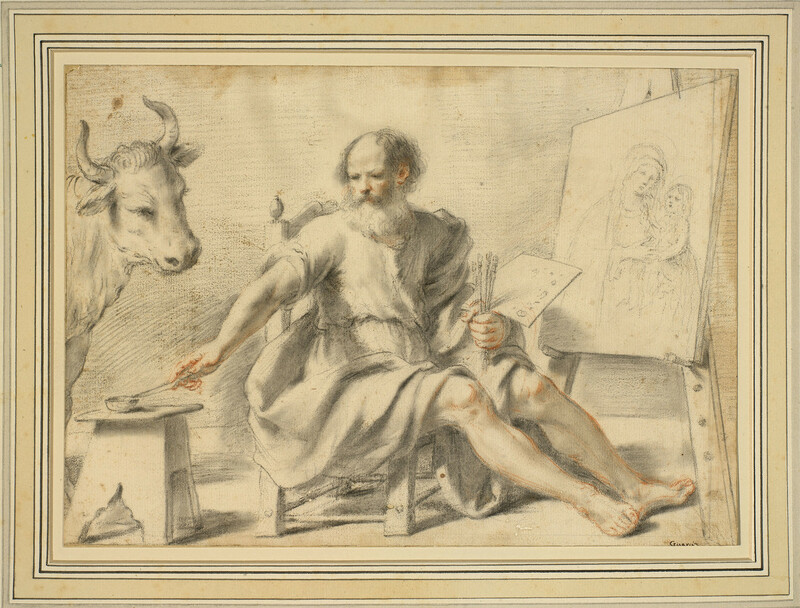 In this drawing the St Luke is shown seated on a low chair, about to begin painting his miraculous image of the Virgin and Child, outlined on a panel propped on a pegged easel. In his left hand he holds a square palette dotted with paint and four brushes; he turns to dip a painting knife into a bowl on a stool by his side. His attribute of an ox looks on. Guercino did execute a painting of St Luke with his miraculous image of the Virgin (Nelson-Atkins Museum of Art, Kansas City) but the present drawing is quite different in format and composition, and surely unrelated to the production of the painting. Given the level of finish and the sophisticated combination of red and black chalks – quite unlike Guercino’s usual preparatory drawings – it was presumably drawn as a finished work of art. Indeed, the staining around the edges and woodworm holes at lower centre show that it was framed and hung at an early date. The tradition that St Luke the Evangelist had painted an image of the Virgin and Child may date back to the fifth century, when Eudoxia, consort of the Byzantine Emperor Theodosius II, was reputed to have brought an icon painted by the saint back from the Holy Land. The monastery of the Panaghia Hodegetria was built in Constantinople (now Istanbul) to house the icon, which was moved to the monastery of the Pantocrator in the thirteenth century and lost at the fall of Constantinople in 1453 (though many surviving versions across Christendom are claimed to be the original miraculous image). The icon showed the Virgin full-length, gesturing towards the Christ Child held in her left arm while he raises his right hand in blessing, but most of the copies of the image are half-length and this format became widespread in Western Europe from the twelfth century onwards. St Luke was consequently adopted as the patron saint of artists, and many artists’ guilds, confraternities and academies across Europe were dedicated to his name, such as the Sint-Lukasgilden in Antwerp, Amsterdam and many other cities of the Low Countries, the Accademia di San Luca in Rome and the Compagnia di San Luca in Florence. Those bodies frequently furnished their corporate chapel with an altarpiece of St Luke painting the Virgin and Child – or on occasion drawing; one of the earliest such altarpieces is Rogier van der Weyden’s panel (Museum of Fine Arts, Boston), which shows the saint making a life drawing in metalpoint from the living Virgin and Child seated before him.